Alliance has launched an ambitious plan for Bangor Town Centre, aiming to secure future investment opportunities, One Unified Plan for Bangor Town Centre and transforming the area into a cultural hub for everyone. Launched ahead of the local government elections on May 22, the manifesto was developed as a coherent response to views received from residents, businesses and visitors alike – with the goal of taking the town centre to 2020 and beyond. Showcasing how the Party is stepping forward for everyone in the local community, the impressive strategy includes plans for a business improvement district, opening up use of the old Court House for community use, progressing the public realm initiative. 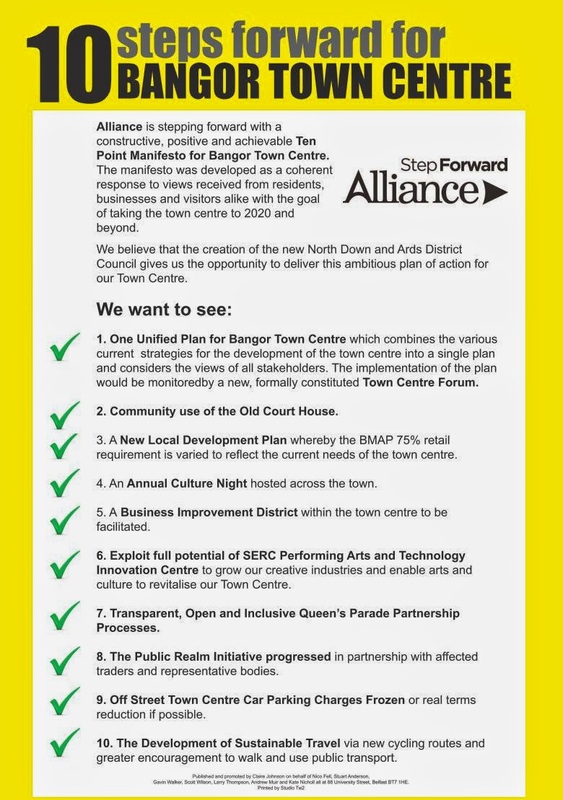 Nico Fell, a representative for Bangor Central, said: “Alliance wants to see Bangor town centre fulfil its potential and believes it can be a business and cultural hub for everyone in North Down. “By focussing on attracting investment and securing local businesses, we will ensure our high streets remain attractive places to visit and shop - and at the heart of this is the need to refurbish derelict buildings and revitalise vacant area, including Queens Parade through transparent, open and inclusive partnership process. But there is also something extra we can offer. By putting resources into the arts and local heritage we can create a cultural experience for everyone living and visiting the Bangor area. By opening the old Court House up to the community and exploiting the full potential of SERC Performing Arts and Technology centre we have the facilities and ideas to deliver this.